Paul Karl Ludwig Drude (July 12, 1863–July 5, 1906) was a German physicist specializing in optics. He wrote a fundamental textbook integrating optics with Maxwell's theories of electromagnetism. He was born in Braunschweig, the son of a physician. Drude began his studies in mathematics at the University of Göttingen, but later changed his major to physics. His dissertation covering the reflection and diffraction of light in crystals was completed in 1887, under Woldemar Voigt. 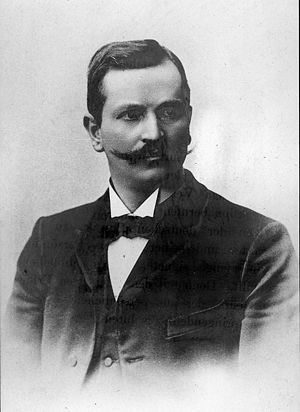 In 1894 Drude became an extraordinarius professor at the University of Leipzig; in the same year he married Emilie Regelsberger, daughter of a Göttingen lawyer. They had four children. In 1900, he became the editor for the scientific journal Annalen der Physik, the most respected physics journal at that time. From 1901-1905, he was ordinarius professor of physics at Giessen University. In 1905 he became the director of the physics institute of the University of Berlin. In 1906, at the height of his career, be became a member of the Prussian Academy of Sciences. A few days after his inauguration lecture, for inexplicable reasons, he committed suicide. Drude was survived by his wife and four children. Drude graduated the year Heinrich Hertz began publishing his findings from his experiments on the electromagnetic theories of James Clerk Maxwell. Thus Drude began his professional career at the time Maxwell’s theories were being introduced into Germany. His first experiments were the determination of the optical constants of various solids, measured to unprecedented levels of accuracy. He then worked to derive relationships between the optical and electrical constants and the physical structure of substances. In 1894 he was responsible for introducing the symbol "c" for the speed of light in a perfect vacuum. In 1900 he developed a powerful model to explain the thermal, electrical, and optical properties of matter. The Drude model would be further advanced in 1933 by Arnold Sommerfeld and Hans Bethe, becoming the Drude-Sommerfeld-Model. Lehrbuch der Optik, Leipzig, 1906. Jungnickel, Christa and Russell McCormmach. Intellectual Mastery of Nature. Theoretical Physics from Ohm to Einstein, Volume 1: The Torch of Mathematics, 1800 to 1870. University of Chicago Press, paper cover, 1990a. ISBN 0-226-41582-1. Jungnickel, Christa and Russell McCormmach. Intellectual Mastery of Nature. Theoretical Physics from Ohm to Einstein, Volume 2: The Now Mighty Theoretical Physics, 1870 to 1925. University of Chicago Press, Paper cover, 1990b. ISBN 0-226-41585-6. ^ Jungnickel, 1990b, p. 167. ^ The book was translated into English by C. R. Mann and Robert Millikan and published in 1902, under the title The Theory of Optics. (Jungnickel, 1990b, p. 171.) Dover Publishing still (2006) offers the 1902 translation. ^ Jungnickel, 1990b, p. 171. Drude crater on the Moon is named for him. The Paul-Drude-Institut für Festkörperelektronik, in Berlin, was named in his honor.